Jeri Smith-Ready: BRING ON THE NIGHT has arrived! BRING ON THE NIGHT has arrived! With this horrible heat wave, we could use a few days of nothing but night, huh? Well, bring it on! At long last...after a fourteen-and-a-half-month wait since Bad to the Bone...it's here! Technically Bring on the Night's release date is tomorrow, but it's shipping from most online booksellers already (follow that link to order your copy), and is already on the shelves at many Barnes & Nobles. To save gas and time, you can even check your local B&N's inventory online. For instance, if you live in Duluth, you can see that the Miller Hall Mall location has copies. Just follow that link and punch in your own zip code to see which B&Ns near you are cool enough to carry it. If they don't, they can always order it for you. Borders should have their stores' inventory listed as of tomorrow, but as of now it's still considered a pre-order. If you need convincing, you can read the first two chapters. The first one is really short (don't panic), so they let me give you a bonus. Also, For What It's Worth book blog did a lovely non-spoilery review which will give you an idea of what Bring on the Night is about. Very few advance copies were sent out for this book because we were extra paranoid about spoilers. Q. What's Bring on the Night about? When does it take place? Who are the main characters? Bring on the Night (named after the Police song) is the third installment of the WVMP Radio series, aka "the vampire DJ books." As always, former con artist Ciara Griffin, a twenty-something snark addict/commitment-phobe, is the narrator. It begins two-and-a-half years after the end of Book 2, Bad to the Bone, so for readers new to the series, it's probably a good place to jump in. It's got plenty of action, both vertical and horizontal, to keep lovers of urban fantasy and paranormal romance very happy. But current readers will find it particularly rewarding, as there are some major leaps in character development. As Bring on the Night begins, Ciara is about to finish her bachelor's degree and has just begun training for the paranormal paramilitary agency, the Control. She's living happily with her vampire boyfriend, Shane, and their vampire dog, Dexter. Things are good. And then they're not. This is a book in which a zombie invasion is not Ciara's biggest problem. As I've mentioned before, you really need to read Bring on the Night before you read ABOUT Bring on the Night, because you don't want to be spoiled. You've been warned three times now, so my work is done. Q. 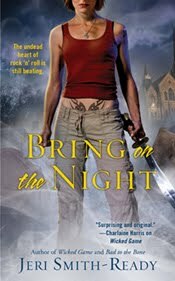 Will Bring on the Night be released in the larger trade paperback form? No, it will only be in mass market paperback (and pretty much every e-book format). The smaller size and price is more appropriate for the typical urban fantasy reader, who buys TONS of books every month. These readers rock! Q. But...but...Wicked Game and Bad to the Bone were in trade paperback. My bookshelves will look uneven! Well, if symmetry means that much to you (and believe me, the Shane in me sympathizes), Wicked Game and Bad to the Bone are also available in mass market paperback. Currently all order links on my website point to the mass market versions. I wholeheartedly support this decision by my publisher to switch all their urban fantasy titles to mass market. But even if I didn't, authors don't make any decisions regarding format, languages, price, etc., so all complaints should be directed, um, elsewhere. Q. Why the switch from present tense narration to past tense? Ahhh, I could write a whole essay on that topic. The simplest answer is that I wanted Bring on the Night to stand out from the other (three, hopefully four) books in the series, for reasons that will become obvious when you read it. Bring on the Night is darker and more introspective, and I think past-tense narration lends itself better to that mood. Also, one of the reasons I used present tense in the first place was because Ciara is a (former) con artist. The reader has reason to mistrust her telling of events, unless they're experiencing them with her. In Bring on the Night, Ciara is definitely not a con artist. She has to learn to develop her physical strength and trust her emotional passions, because when the proverbial chips are down, sometimes cleverness isn't enough. Q. How many books will be in the WVMP series? Five, I hope! But so far I am only guaranteed four. Book Four, Let It Bleed, will be out this time next year. Ciara meets more of her blood relatives, who are scarier than most vampires. It's chock full of con artist-y goodness! Q. Why zombies? Will you be introducing other paranormal creatures to the series? Way back when I wrote Wicked Game, there was a reason the paranormal paramilitary agency known as “The Control” was called the International Agency for the Control and Management of Undead Corporeal Entities, not the International Agency for the Control and Management of Vampires. I wanted to leave the door open for a certain other kind of UCE (or “yoosie,” as the human Control agents refer to the undead when they’re out of hearing range). No, I definitely will not be adding more paranormal creatures. Like vampires, zombies are created using blood magic (reanimated by a necromancer for his or her nefarious purposes), so they are logically consistent with this universe. Throwing in other creatures with other origins and explanations would make my head explode. I'm having a hard enough time explaining Ciara's anti-holy blood and figuring out where vampires go when they die, without adding faeries and werewolves to the creative cauldron. Q. OK, you talked me into it. How can I get an autographed copy? Order from Constellation Books, a fabulous independent bookstore in Reisterstown, MD. When you place your order, be sure to let the nice folks there know whether you want it simply autographed or if you want it personalized (i.e., "To [name of righteous reader who supports indie bookstores and is therefore, at this exact moment, my ultimate BFF]"). Please allow 4-6 weeks for delivery. Fill out the contact form and ask me for a signed, personalized bookplate. Tell me which book(s) you’d like, how you’d like it personalized, and (most important) your mailing address. No charge to you! Please allow 6-8 weeks for delivery. My administrative staff consists of an as-yet-uncloned me. OR, Send your copy of the book to me at P.O. Box 66, Westminster, MD 21158 with a self-addressed stamped envelope for return. Let me know how you’d like it personalized. Again, allow 4-6 weeks for delivery. Q. Hmm, I think I'd prefer to win a copy, and I feel pretty lucky this week. So any contests? Yes! My publisher is sponsoring some giveaways around the blogosphere this week, which I will link to on Twitter and Facebook as I become aware of them, or you can Google it. But I'm giving away three signed copies this week! Before I send each quarterly newsletter issue, I draw two names to win a prize, and this issue's prize is, shockingly, a signed copy of Bring on the Night. All you have to do to enter is be subscribed to my newsletter (the signup box is on every page of my website, including the sidebar of this blog). Deadline: 11:59pm eastern today. International entries welcome! Also, at the end of the week, I will draw a name from the people who "like" my Facebook "fan" page (or whatever the heck they're calling it these days) to win a signed copy of Bring on the Night. Deadline: 11:59pm eastern Friday, July 30. International entries welcome! Tomorrow I'll post the playlist (which includes such diverse artists as Beethoven, the Brady Bunch, and Marilyn Manson, along with the usual rock 'n' roll favorites), and why I picked some of the songs, other than the fact that I love them to death. So glad that everyone else gets a chance to read Bring on the Night if only for the selfish reason that I need someone to talk to about it with!! It was fantastic - just like the rest of the series & everything else you write! You never disappoint. Sadly, I recently discovered Shade & was interested in Getting into the WVMP series, but my book store is out of them & its' a long wait to get them ordered! I'm looking forward to actually getting them! I'll be eagerly checking back to see if I'm a lucky winner too! Congrats on the release & best wishe!...PS thanks again for Shade! Congrats on the release!!! It'll be number 1 tomorrow! Jennzah, thanks for spreading the word--you rock! I love Lisa's blog. She's a sweetie. Carrie: I could send you a bookplate so you don't have to send the book, although that's fine, too. I know, I will be horribly sad to see it end either way. This series will probably always be my favorite. I can't imagine anyone's head more fun to be in than Ciara's. Karen: I know, I can't wait to see what people think! I might set up a discussion forum on my Facebook page. I don't have the wherewithal (i.e., the know-how) to do it here on the website. Sharon K: Thank you so much!